A growing portion of our business is the repair of retaining walls and brick paver patios, walkways and drives. We love the work. We love having the opportunity to make another client happy, especially when their previous experience wasn’t as well received. But if we’re being called to repair a hardscape, often it’s because it wasn’t built correctly in the first place. And that’s the unfortunate part. Lack of geogrid, which makes a mechanical connection to the soils a wall retains, effectively increasing the mass of the wall, which increases its strength and resistance to movement and failure. 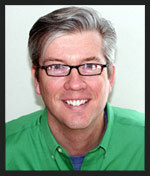 Almost all walls over 4′ in height should have it, and we often use it for walls over 3′ in height. Lack of adequate drain field behind the wall. One of the biggest enemies of a retaining wall is water. Water gets behind the wall, and if there isn’t a way for it to exit from behind the wall, during the late Fall and early Spring, the water freezes overnight, pushing the wall the tiniest of distances. In the morning the ice melts, water wedging itself a bit deeper, to push further on the wall at the next overnight freeze. In the wall pictured above, there was very little clear (washed) stone behind the wall to carry the water away. Lack of separation between clear stone and native soils. Without a water-permeable barrier between the soils and the clear stone, soil particles move into the spaces between the clear stone, making the clear stone drain field unable to function; it’s all gummed up with dirt. Improper slope of surface-level soils and lack of drainage. 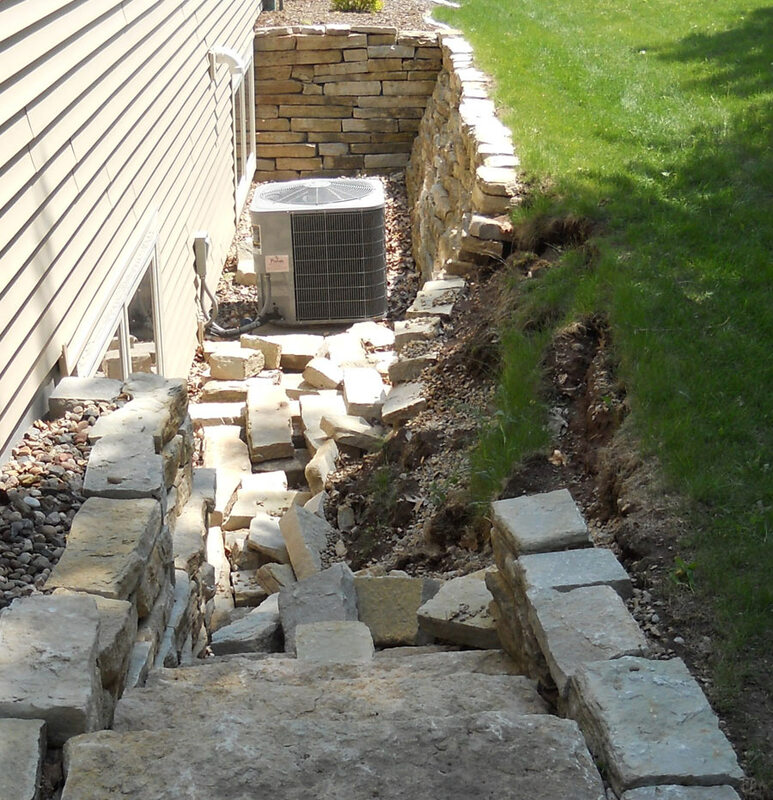 It appeared that the previous contractor did spend some time ensuring there was proper slope along the back and side yards, but they fell just a bit short, with some water pooling at about the location of the failure of the wall. That, coupled with a large portion of stormwater from the roof that emptied from a downspout nearby, overloading this area, allowed water to accumulate en masse behind the wall, expediting the failure. Pictured below, you can see the wall rebuild nearly complete; layers of geogrid in place, geotextile separating soil from drain field, and a nice, thick vertical column of clear stone to collect water, carry it to a perforated pipe which carries it through the face of the wall to empty to the grade beyond. But maybe most importantly to the long-term success of this retaining wall was the surface-level slope work and drainage work we performed. In the swale of the sideyard, running parallel to the longest side of this wall, we installed a sub-grade drainage field to take all stormwater beyond the wall, toward the street. We also connected 4″ schedule 40 pvc pipe to that downspout, routing all water from the roof to an existing piping system that also carries the water to the stormwater system. 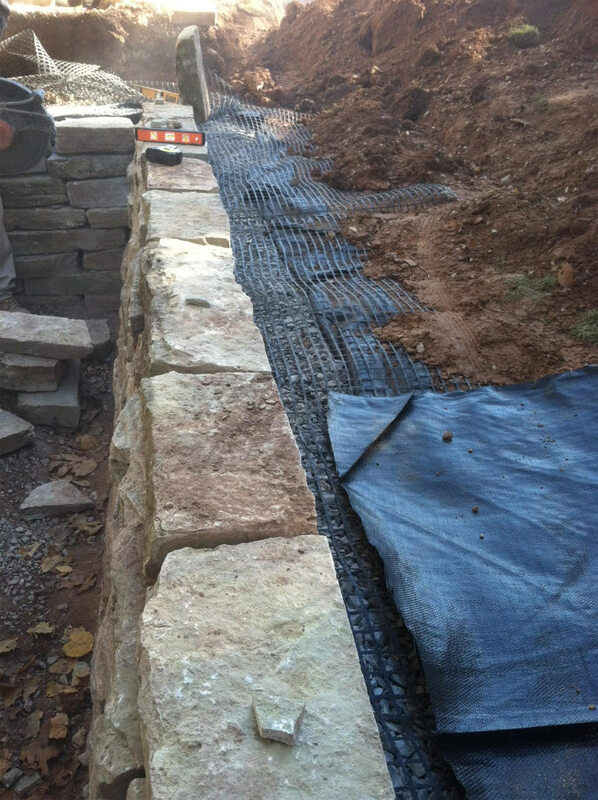 With a multi-pronged drainage system now in place, and the wall engineered and rebuilt from the ground up, we expect this client to enjoy years free from future retaining wall issues. And these approaches we take to repairing retaining walls? We do the same kinds of things for brick pavers. If you have a failing paver area or a retaining wall in need of repair, please get in touch. We’ll be happy to discuss your options.